Trust. It’s one of those things we get to learn by just doing it. I admit it, I have trust issues. After a lifetime of trusting the wrong people with my life I have learned you can’t trust everybody with everything. I was so naive. People are people. They have their own agendas. And sometimes they break your trust for their own reasons. Sometimes though this has hindered my walk with trusting God. I am learning that even though people have let me down -God is faithful. He is true. And I can trust God during the dark seasons of my soul. We are not alone. We have not been forsaken. He will deliver – He promised! Romans 8:37-39 Yet in all these things we are more than conquerors through Him who loved us. For I am persuaded that neither death nor life, nor angels nor principalities nor powers, nor things present nor things to come, nor height nor depth, nor any other created thing, shall be able to separate us from the love of God which is in Christ Jesus our Lord. 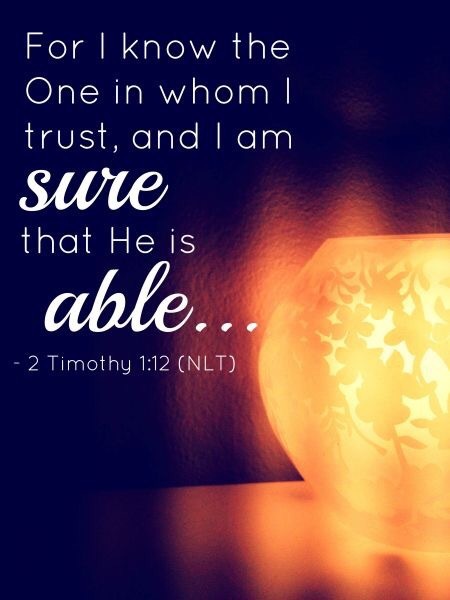 Posted in faith, God, Healing, Hope, Music, Quotes, Religion and Spirituality, Spirituality, Uncategorized, Videos and tagged fairh, faithful, God, He is With Us, Inspiration, Love and the Outcome, music, promises, quotes, trust, Trust God quotes, Video. Bookmark the permalink. Lovely quotes! Thank you for sharing! Amen!! I needed this right now. Thanks for always sharing what I need to hear. You are a blessing, my sister! Amen! I too have trust issues, even with God Himself. He once taught me that I can distrust Him if I like, but He is still the one in charge, in control, and my need to trust Him is really only about my own comfort level. Life is much easier when we can lean into Him and trust in His ways. Or, I could be fearful and uncertain, but that of course, just makes one fearful and uncertain. God calls us to go boldly before the throne of grace, to walk in His victory. Very well said my friend – thank you!